World Theatre Day is an international celebration of theater and the impact that theater has on communities and individuals across the globe - and it's just now catching on in the U.S. Last year, Chicago launched the first community-wide celebration of World Theatre Day in the US which was also held at Chopin Theatre. World Theatre Day is an international celebration of theater and the impact that theater has on communities and individuals across the globe - and it's just now catching on in the U.S. Last year, League of Chicago Theaters launched the first community-wide celebration of World Theatre Day in the US which was also held at Chopin Theatre. The evening begins at 730p with performances by resident companies Backstage Theater (Studio - "Orange Flower Water") and 8p House Theatre (Mainstage - "Wilson Wants It All"). Downstairs - features live music and loungey hob-nobbing with the folks who make Chicago theatre tick. Lobby - social media connections fuel an international conversation with a host of Chicago's international friends. Mainstage - Chris Piatt, former theatre editor for TimeOut Chicago, brings his PAPER MACHETE live magazine to investigate - and roast - Chicago's historic relationships with other cities in "The Second City Complex." YOU - World Theatre Day is all about generating cross-cultural dialogue that explores the power of theater to celebrate life and effect social change through collaborative performance. This year, we want to put you and your theater in the driver's seat of that discussion, by encouraging you to send a public shout out to an international "sister" company of your choice. STEP ONE - Make Contact. Find an international theater company or artist - maybe you already know them, or maybe we can hook you up with one - and think about what issues, ideas, and dialogue you would want to share them. 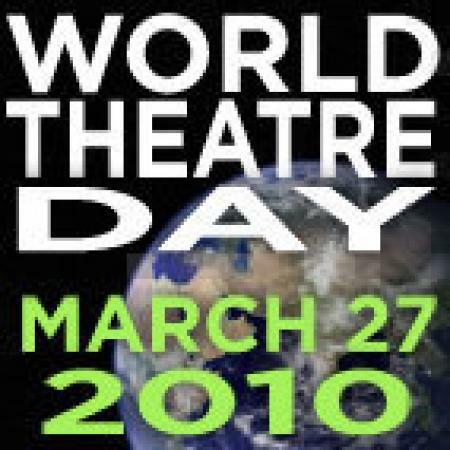 Tell them about World Theatre Day and what we're doing in Chicago. STEP TWO - Talk it out. Record a video or audio greeting to that sister company, and have them send one to you. Share your thoughts about issues, listen to what your new international friends are working on and trying to accomplish. Find common ground. STEP THREE - Share. Make a record of your conversation - a video greeting, an audio recording of a skype conversation, a collaborative art project, a photo - and post it to the internationally-contributed World Theatre Day tumblr blog (http://wtd10.tumblr.com), just by emailing a link to what you've made to http://tinyurl.com/wtdmedia, or ask us for help at worldtheatreday@nikku.net.